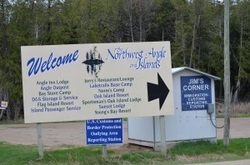 Sunset Lodge is located on Oak Island up at the Northwest Angle of Lake of the Woods. For driving directions, use Young's Bay Resort (7600 Young's Bay Dr NW, Angle Inlet, MN 56711) as a destination point as MapQuest and Google Maps do not calculate directions to Oak Island correctly. It takes about 10-15 minutes to drive (winter) or boat (summer) from Young's Bay to Sunset Lodge. We can arrange a shuttle service from all locations. If you are arriving via your own boat. we recommend purchasing Lake of the Woods maps 6211 and 6216 (Strieffs in Warroad should have them). Those maps show all the rocks and navigation routes. 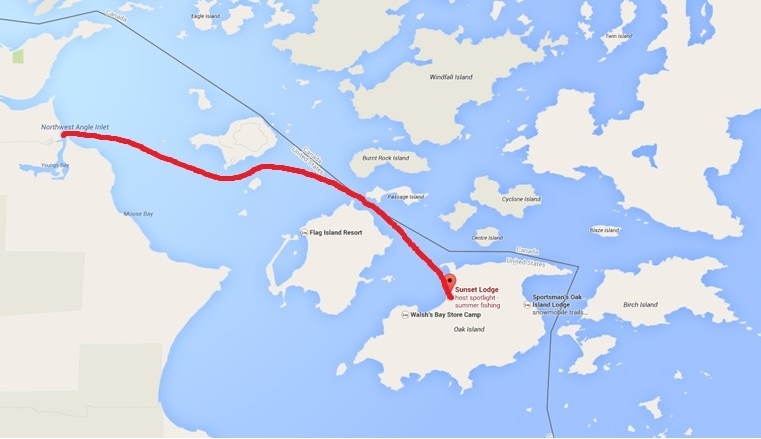 Map showing how to arrive at Sunset Lodge via Young's Bay (Angle Inlet, MN). In the winter months, Sunset Lodge is accessible by vehicle on plowed roads from Young's Bay (Angle Inlet, MN) directly to our front door. In the winter you drive around Jerry's Bar to the right where you will get on the ice road. Once on the lake head to your right and then you will begin seeing signs for Sunset Lodge! You can also arrive by snowmobile from either Young's Bay or the south shore of Lake of the Woods. We can arrange a shuttle service from the south shore. Staff at Young's Bay Store will direct you on where to park your vehicle and answer any questions you have about launching your boat. Rental cars are available from these locations. Ground transportation or boat/bomber transportation can be arranged from this location to us on Oak Island. Float planes may also land right out in front of Sunset Lodge and be docked in our protected harbor! Sunset Lodge is located in Minnesota but to drive to Young's Bay you must cross through Canada. You can cross the border into Canada in either Warroad or Roseau. It takes about 1 to 1.5 hours to drive from either border crossing to Young's Bay. Head north of Warroad on MN-313 N approximately 6 miles to the Canadian Customs border crossing. Stop and clear customs. You are now in Canada and the highway number has changed to MB-12. Continue on about 8 miles to Sprague. Turn right on MB-308 N, drive through the town of Sprague and continue for about 20 miles. The road turns to gravel just past the cut off to Moose Lake. Stay on MB-308 N for about 5 miles, till you come to junction MB-525 E and turn right (this is a T junction and you must turn right to get on MB-525 E). Continue about 14 miles until you arrive at Jim's Corner. (You will arrive at a stop sign and Jim's Corner will be in front of you.) At Jim’s Corner, you are required to stop and “call-in” after making the journey from the border. To call in, you push the USA flag button to let them know you are returning to the States after driving through Canada. When calling in, you will need to provide the following information: full name, date of birth, citizenship, and boat/vehicle license or registration number from all travelers in the party. NEW!!! : As of October 2017, you have the option to report back into the US when you arrive at Sunset Lodge using an iPad station instead of calling in at Jim's Corner. You will need to provide the following information: full name, date of birth, citizenship, and boat/vehicle license or registration number from all travelers in the party. When facing Jim's Corner you will see that Dawson Road (County Road 49) goes to your right. Follow this road and the signs to Young's Bay. Head north of Roseau on HWY 310 approximately 10 miles to the Canadian Customs. Stop and clear Customs. You are now in Canada. Continue on to the junction with MB-12 S (about 1.5 miles). Turn right and drive about 8 miles to Sprague. Turn left on MB-308 N.
When you leave the NW Angle, you must also call in at Jim's Corner, but this time, push the CN flag button. This is to let them know you will be driving through Canada to return to the US. When calling in, you will need to provide the following information: full name, date of birth, citizenship, and boat/vehicle license or registration number from all travelers in the party. The TRC may confirm documentation numbers at the time of reporting (when you stopped at Canadian customs by Roseau or Warroad). If you are not in possession of a Passport you will be asked for another form of identification such as a Nexus Card, Birth Certificate and/or Driver’s License. The officer will give you a reference number so be prepared to write this down.